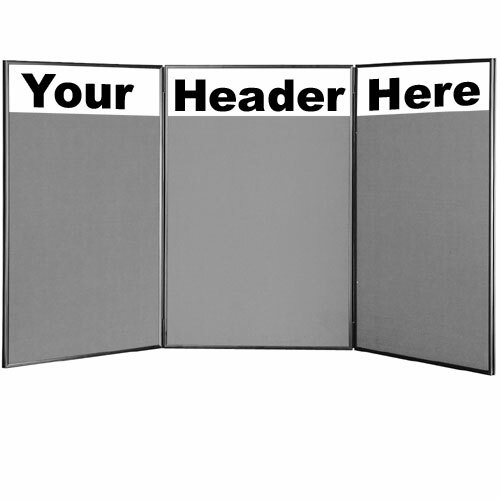 These gray custom text hook and loop boards feature a 72" x 36" fabric area for posting advertisements. 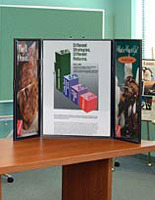 The displays are great for commercial events like expositions and trade shows because they can fit on any booth tabletop. Each of the custom text hook and loop boards is double sided and features a black back for different showcase options. 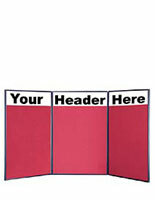 Each tabletop event fixture comes with a header that can be printed with 1- or 2-color messaging. The double sided hook and loop boards are vinyl imprinted with a choice from nine different shades. The displays are also available with the option of red and blue fabric.